The macula is found at the center of the retina where the incoming rays of light are focused. The macula is responsible for what we see straight in front of us, for the detailed vision needed in activities such as reading and writing, for recognizing faces, and our ability to appreciate color. Macular Degeneration is a condition in which the delicate cells of the macula become damaged and stop working. Vision loss usually occurs gradually and typically affects both eyes at different rates. The root cause of macular degeneration is unknown, but it tends to happen as people get older. There are two forms of age-related macular degeneration, namely "dry" and "wet". The "dry" form makes up around 70% of cases: the visual cells simply cease to function, like the colors fading in an old photograph. The process involves thinning of the macular tissues and disturbances in its pigmentation. The "wet" form makes up the remaining 30% of cases and can involve bleeding within and beneath the retina, opaque deposits, and eventually scar tissue. The "wet" form accounts for 90% of all cases of legal blindness amongst macular degeneration patients. The dry form will often begin to convert to wet, with the formation of abnormal choroidal blood vessels – angiogenesis. The reason why angiogenesis occurs is unknown but it is believed that this additional blood vessel development is somehow caused by deposits being left in the back of the eye. These deposits are similar to age spots on the skin. These new blood vessels are fragile and have a propensity to leak and bleed, eventually forming scar tissue and resulting in irreversible vision loss. Studies of twins indicate that both genetic and non-genetic factors play important roles in age-related macular degeneration. If several members of a family are sufferers then it is very important that other members have their eyes checked regularly. Inherited macular degeneration is known as macular dystrophy. Any type of smoking or exposure to tobacco smoke can accelerate the development of the "wet" type of macular degeneration. The formation of new blood vessels and yellow deposits ("drusen") in and under the macula is often the first physical sign that macular degeneration may develop. In the early stages, central vision becomes blurred or distorted, with objects having an unusual size or shape. This may happen quickly or develop over several months. The patient may be very sensitive to light or actually see lights that are not there. Those with the advanced condition will often notice a blank patch or dark spot in the center of their sight. This makes activities like reading, writing, driving and recognizing small objects or faces very difficult. 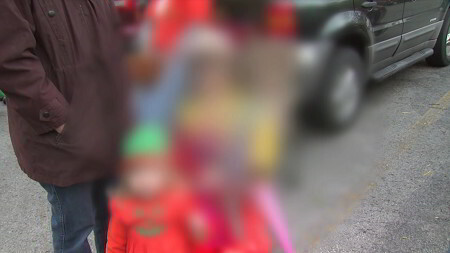 Peripheral vision (side vision) isn't affected by macular degeneration. 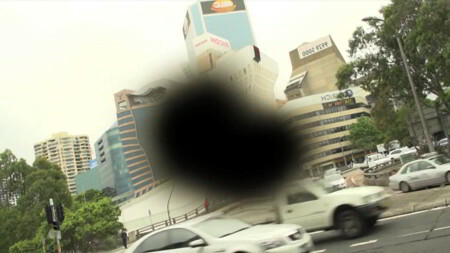 Some cases of age-related macular degeneration are detected early during a routine eye test. It will often be suspected in those aged over 60 who are experiencing changes in their central vision. Amsler grid eye test: Cover one eye and look at the dot in the center. Note any blurry, distorted, broken or missing lines. 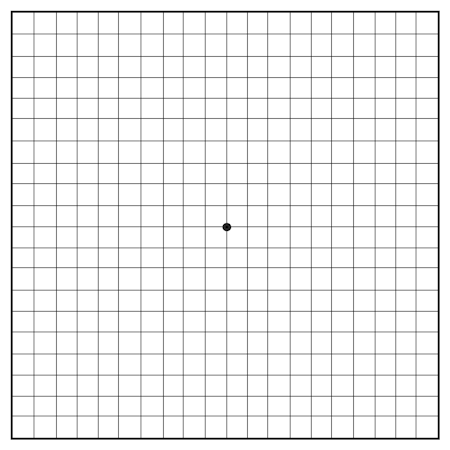 The Amsler Grid – viewing a simple black-and-white grid with a dot at the center to see if areas on the grid are distorted, blurry, or discolored. Surgery. Laser surgery to remove the scar produced by macular degeneration has been successful in about 10% of people with disciform degeneration, mainly the younger patients. If the degeneration is associated with leaking blood vessels in the center of the macula and vision is worse than 20⁄70 then laser surgery called photocoagulation is recommended. This will not improve vision but generally reduces further vision loss. Unfortunately for most people, the area of degeneration is in the middle of the macula, at its focal point. This means that treatment cannot be given because the scars produced by the laser would make central vision worse rather than better. 'Dry' degeneration cannot be treated by laser. Special sunglasses that block out the blue end of the spectrum may decrease the progress of the disease. It has been demonstrated that the blue rays of the light spectrum seem to accelerate macular degeneration more than the others. This means that very bright light, such as sunlight or its reflection in the ocean and desert, may worsen macular degeneration. Although the medications used to treat hypertension have not been shown to have any direct effect on macular degeneration, they may slow progression of the disease by reducing hypertension. Hypertension tends to make some forms of macular degeneration worse, particularly in the "wet" form where the retinal tissues are invaded by new blood vessels. In some cases, macular degeneration may be active and then slow down considerably, or even stop progressing for many years. Any type of smoking or exposure to tobacco smoke can accelerate the development of the 'wet' type of macular degeneration. Smokers on average exhibit only half the density of yellow macular pigment (lutein and zeaxanthin) and develop macular degeneration 7 years sooner than non-smokers. A study published in October 2011 and involving 4,000 elderly participants across Europe found that those who took aspirin every day were twice as likely to be diagnosed with late stage age-related macular degeneration (AMD) as those who did not. NOTE: For those suffering from heart disease, the benefits of taking aspirin outweigh the risks posed to their vision. During another major study at the Netherlands Institute for Neuroscience and Academic Medical Centre, researchers followed 839 people and found that among those who took aspirin each day, around 4% had an advanced form of the disease called neovascular or 'wet' AMD, which leads to the most profound blindness. In comparison, just 2% who took aspirin less frequently had the same disease. A more conclusive Australian study was published January 2013 in the Journal of the American Medical Association (JAMA) and followed 2,400 subjects for 15 years. It found that 3.7% of the 'occasional' users of aspirin and 9.4% of the 'regular' users developed wet AMD. Harvard University researchers found that the B vitamins protect our eyes. Those taking daily B6, B9 (folic acid) and B12 supplements had a significantly reduced risk of developing age-related macular degeneration. Selenium is sometimes recommended, but you should always consult your physician to determine appropriate dosages.